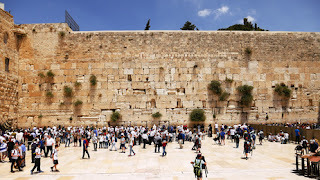 Jews and Gentiles pray together at the Western Wall. For over 3000 years there has been hostility between Jew and Gentile across the world. It began with the sons of Abraham, Ishmael and Isaac, and continued through Jacob and Esau and their descendants. The word for gentile in the New Testament means ‘other nations’ or ‘Hellenists’, describing those of the known Greek world and of pagan influence. In general in both Old and New Testament, it means anyone who is not of the 12 tribes of Israel. But the Apostle Paul clearly indicates that ‘in Christ’ Jew and Gentile are ‘one new man’! Paul, of the Tribe of Benjamin, was passionate for the Jewish people to accept Christ even though his primary call was to the Gentiles. For the Jew it was difficult to accept Jesus as Messiah. They believed in Yahweh and the words of the prophets of a coming messiah, but they were expecting someone much different than Jesus. For Gentiles it was the problem of only one God instead of many and the concepts of sin and righteousness. But the Gentile world embraced Jesus as Lord and Savior even as most of the Jewish world rejected him as Messiah. The hostility between Jews and the Gentile church increased over hundreds of years prior to the reformation. Scripture is clear that all nations would be blessed by the seed of Abraham bringing salvation and deliverance, and that justification is by faith not through the Law of Moses. "For we maintain that a person is justified by faith apart from the works of the law. Or is God the God of Jews only? Is he not the God of Gentiles too? Yes, of Gentiles too, since there is only one God, who will justify the circumcised by faith and the uncircumcised through that same faith". Rom. 3:28-30. Today we may look at the Jewish people who are vastly secular in belief. We look at Israel, while a Jewish state, has many non-practicing Jews is very secular in world view. How can all this come together to create the one new man? Even now I see a coming together of Jew and Gentile believers as the last days move forward. There are more and more Messianic fellowships rising up across the world. Israel had only a few dozen Jewish believers in Messiah in the 1970’s. Today there are about 15,000 Messianic believers in Israel gathering in 120 local fellowships. America and other nations are also seeing God moving the hearts of Jewish people to embrace Jesus as Messiah. One of the reasons is found in Romans 11:11 where Paul says, "Again I ask: Did they (Israel/Jews) stumble so as to fall beyond recovery? Not at all! Rather, because of their transgression, salvation has come to the Gentiles to make Israel envious". The Jewish people are becoming envious of believers in Jesus as we reveal the Father’s heart to Israel and to Jewish people. How we treat individual Jews and the nation of Israel is IMPORTANT to fulfilling scripture and prophetic words of the last days. Our treatment of Jews must pass through the cross. We have a role in appropriating the scripture that through the cross Jesus put to death the hostility. Both Jesus and Paul spoke of ‘the time of the Gentiles’, which is a time when non-Jewish governments and churches dominate the world scene. Both the hardened hearts of Jewish people and the dominion of gentiles are temporary! In speaking to gentiles in Rome Paul says, "Lest you be self-opinionated (wise in your own conceits), I do not want you to miss this hidden truth and mystery, brethren: a hardening (insensibility) has [temporarily] befallen a part of Israel [to last] until the full number of the ingathering of the Gentiles has come in…" Romans 11:25 (AMP). There will be a moment in time when the ingathering of non-Jews to Christ will be fulfilled, and then Israel will awaken to the truth of the Messiah! One new man will emerge in a fullness and strength not yet seen in the church and in the world.